When Forest Lake puts up six goals, there is always the expectation that Lucas Kohls and C.J. Franklin had a significant role in it. Sure, in the quarterfinals of the Schwan Cp Silver Division game against Bemidji, Kohls and Franklin tallied goals, but it was a pair of unlikely players that go the job done for Forest Lake. Brett Gravelle and Kyle VanTassel, not the biggest of Rangers, but some of the hardest working ones, helped Forest Lake defeat Bemidji 6-1 to advance to the semifinals. Against a bigger Lumberjacks team, Gravelle and VanTassel held their own in a big way. Gravelle scored a goal and chipped in with two assists. VanTassel also scored and had an assist for a two-point night. "We have to take some pressure off of our main guys," Gravelle said. "We can't expect them to score three or four goals a game, because there are going to be times where they might not have it. It is our job to step up, too." The duo found ways to maneuver around the ice without taking huge hits from an aggressive, physical Bemidji team, that came out of the gates hitting. Instead, it stuck to their game in moving the puck and being opportunistic. "They are really puck savvy," Rangers coach Aaron Forsythe said. "Those guys are really smart with the puck and know how to go out there and not take huge hits. I was really happy with the way they played, because we need them to do that, get some secondary scoring. "We know that Lucas (Kohls) and C.J. (Franklin) need to play well for us to win, but we need others to step up like this." More importantly for Forest Lake, it was its "Water Bug" line that got it going. Gravelle scored just 2 minutes, 18 seconds into the game and it was VanTassel that gave the Rangers a 2-0 lead near the midway point of the first period. "I was really happy with our start and those two were the ones who got us going," Forsythe said. "They just do everything the right way. You ask them to do something, they will do everything they can to make it happen. "I could not have asked for a better start to the game and they deserve a lot for it." "Anything we can do to help our team we are going to do it," Gravelle said. "We just love to go out there and play and help our team." Forest Lake scored four goals in the first period en route to a 6-1 victory over Bemidji in the quarterfinals of the Schwan Cup Silver Division on Monday, Dec. 26, at the Schwan Super Rink in Blaine. Brett Gravelle had a goal and two assists to lead the Rangers. Kyle VanTassel, Lucas Kohls, Tommy Tyson, C.J. 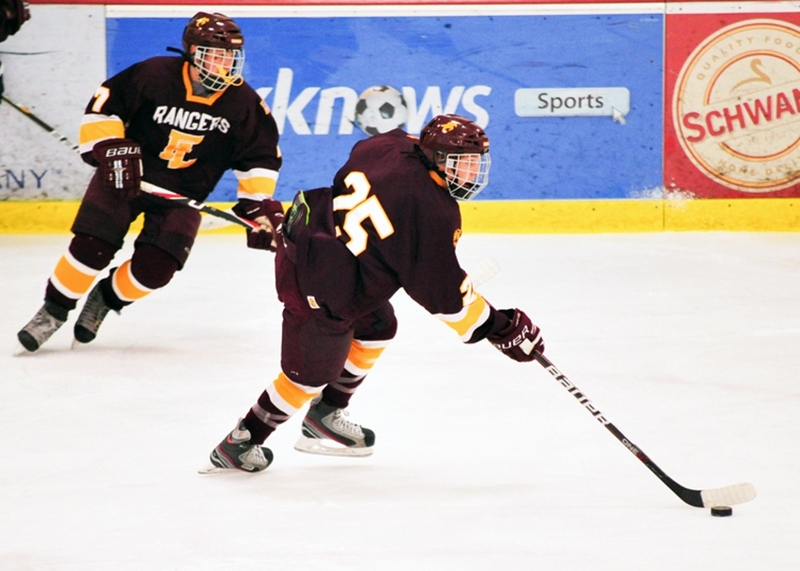 Franklin and Cody Rogala all recorded multiple points for Forest Lake. Gravelle opened the scoring just 2 minutes, 18 seconds into the first period. Forest Lake went up 2-0 six minutes later with VanTassel's goal. Kohls gave the Rangers a 3-0 lead when he got a rebound in front that was able to get under the arm of Bemidji goalie Ben Schram. With 1:32 left in the first, Rogala punched in a goal to give the Rangers a 4-0 lead heading into the first intermission. Gabe Heifort came in relief in goal for the Lumberjacks, but the first shots he saw was from Franklin, which came from the bottom of the right circle and somehow snuck into the net. In the third period, Bemidji's Matt Serratore broke the shutout, when he one-timed a shot from the left circle. With 53 seconds left, Tyson tapped in a goal to make it a 6-1. Forest Lake unloaded 28 shots on goal compared to only 14 for Bemidji. Forest Lake advances to an 8 p.m. semifinal game against Roseville on Tuesday at the Schwan Super Rink in Blaine. Bemidji plays Blake in the consolation semifinals at 3 p.m. on Tuesday at the Schwan Super Rink. Not known as one of the Rangers high-end scorers, Gravelle got Forest Lake on the board in the first period with a goal and recorded two more assists. He was in important factor to the Rangers victory over Bemidji. VanTassel shared the success with Gravelle with a goal and an assist. He is not one of the bigger player on the Rangers roster, but he played with intelligence and was opportunistic. He made the most of his chances in helping Forest Lake defeating the Lumberjacks. The leading points producer for Forest Lake had another solid game with a goal and an assist. He also ripped one off the post on the power-play in the third period, showing off an impressive shot from the blue line.